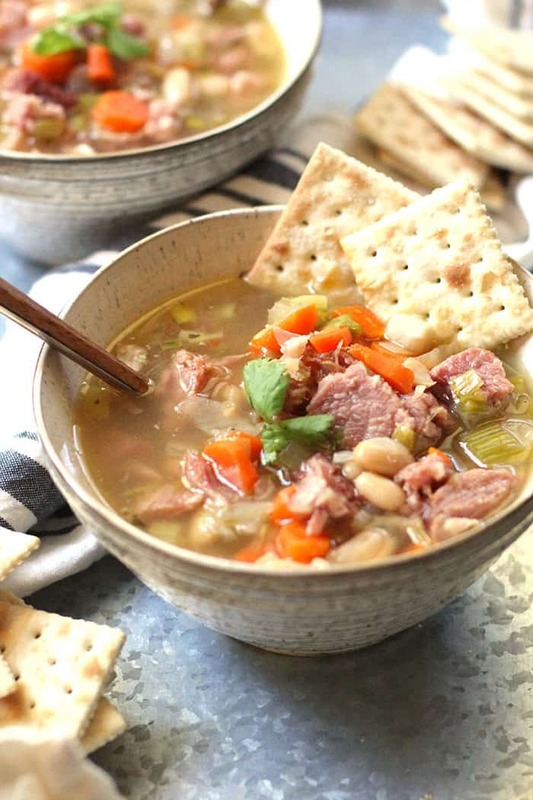 Leftover Ham and White Bean Soup is a clean-out-the-refrigerator type of meal. 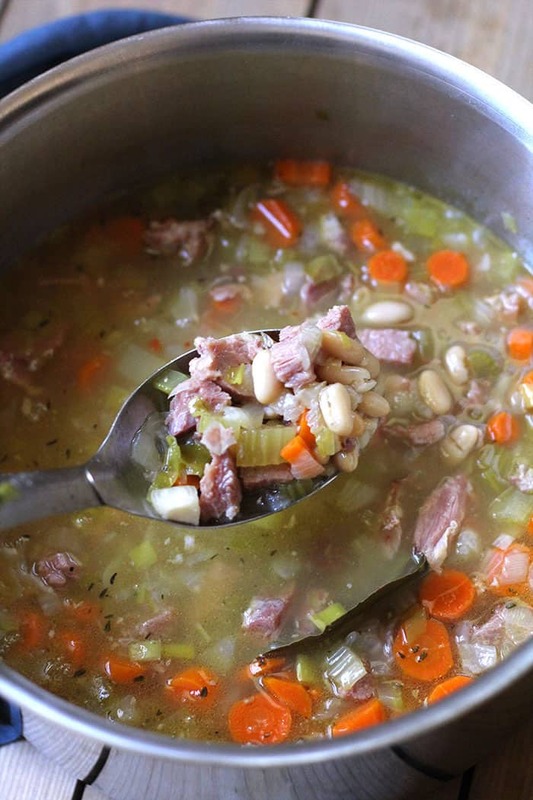 Boil your leftover ham bone for flavor, and add tons of veggies, canned beans, and leftover ham. We cooked a turkey and ham at Thanksgiving. So of course, we had leftovers galore. Josh took a bag of the ham back to school with him and we still had plenty, so I stuck the ham bone and some of the leftover ham in the freezer for a rainy day. 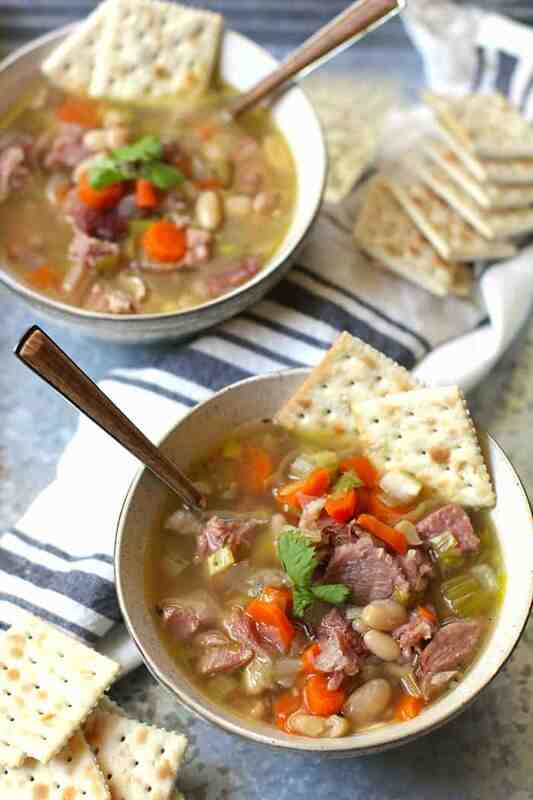 My mom made a mean ham and bean soup when we were growing up. It was her specialty, and it was Dad’s favorite. I’ve tried to replicate it a couple of times to no avail. I just can’t remember exactly how she did it. One thing I know is that she used vinegar to flavor it. When I’ve tried that, it was a bust, and I had to throw it out. So this time, I just made a basic recipe. Nothing fancy and definitely not Norma Jean’s recipe, but it’s good. I used tons of veggies in this Leftover Ham and White Bean Soup. It’s the new year and I’m adding more veggies than ever. You can use any beans you like in this soup. I like the mild cannellini beans to go with the salty ham. Don’t skip the bay leaves for full depth of flavor. I used a Hormel ham. Mom and Dad always bought that brand, and it’s the best. If you don’t have a ham bone, it’s ok. Just follow the recipe after step one. You can make this in a crock pot as well, by combining everything after step two. 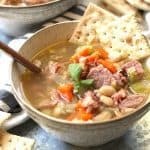 Using a leftover ham bone gives this soup an amazing flavor, along with leftover ham, white beans, and lots of vegetables! In a large stock pot, combine ham bone with chicken broth. Bring to a boil and then let simmer for 45 minutes. Take ham bone out of pot and remove any visible ham. Add ham back to pot. Meanwhile, In a separate pan, heat olive oil to medium heat. Add chopped onion, leek, carrots, celery and spices (salt, pepper, onion powder, red pepper flakes, and thyme). Sauté for approximately 5-6 minutes, or until veggies are starting to soften. Add garlic during the last 30 seconds. Pour all veggies into large stock pan. Then add remaining ham, cannelloni beans, and bay leaves. Simmer for another 45 minutes, or until flavors are well combined. Serve with crackers and some freshly ground black pepper. Don't skip the bay leaves for full depth of flavor. I used a Hormel ham. Mom and Dad always bought that brand, and it's the best. If you don't have a ham bone, it's ok. Just follow the recipe after step one. What a great use for that ham bone and any leftover ham you have. So easy and delicious!! Especially good if you happen to have a sick husband who needs a healthy brothy soup!! I’m so glad you both enjoyed the soup, Shari! 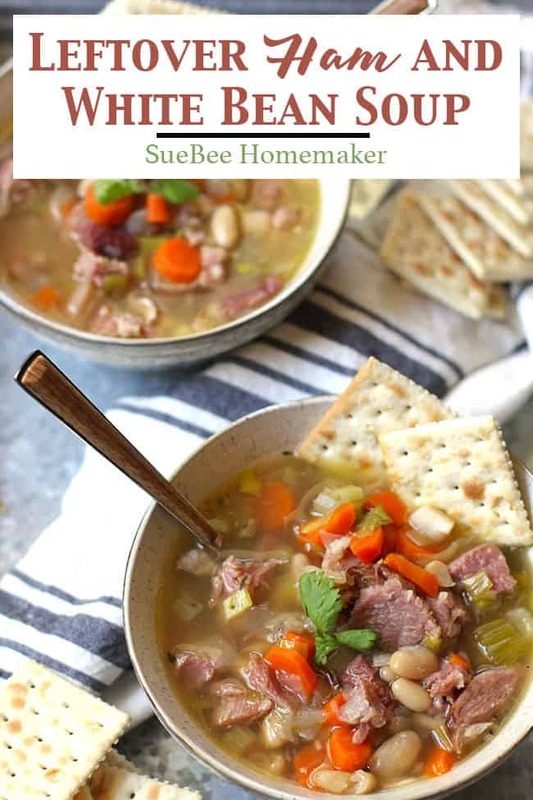 I had leftover ham in the freezer from Thanksgiving and this recipe was perfect! I love soup during the cold months. This recipe is simple and loaded with veggies and fiber. Thank you for sharing it with us! I love it when the high nutrition foods taste so gooood! It makes eating healthy so much easier.